Rapt Studio gives PayPal’s West Village offices a presence that incorporates their brand story and emphasizes collaboration and flexibility. A look inside the Behr Paint Company branded-office environment, created by H. Hendy Associates, reveals the colorful vibrancy of Behr’s brand. Audio post-production company Sonic Union expands into a second location in NYC with Revamp’s help in blending a quirky personality with needs in AV. CCWS Interiors was challenged to throw out the rulebook and defy the conventional office blueprint to provide award-winning gaming firm, Space Ape Games with a cool and contemporary refit that embraced the company’s playful personality. Great grooming is in the details. Rapt Studio expanded Dollar Shave Club’s current office space with the objective to create a holistic design. Wilson Sporting Goods called on their general contractor, Skender, and architects/designers, Gensler to make their new office expansion a captivating space for their employees…. Roy David Architecture unveils Nuvo’s new headquarters that reflects the maternal-fetal health technology company’s data-centric and feminine nature. 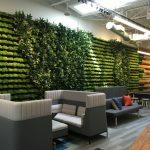 The world headquarters for a Tax Software company in Pennsylvania called on Francis Cauffman Architects (FCA) to create a workspace that was comfortable, collaborative, and distraction free.